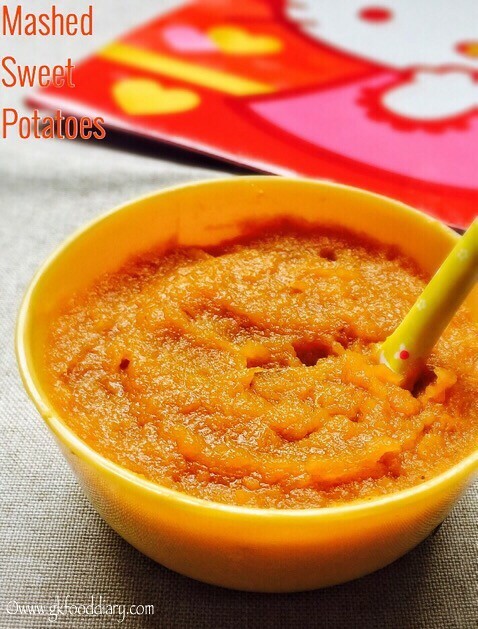 Sweet potato Puree for babies – easy and healthy puree/mash for babies and toddlers. Sweet potatoes is a versatile vegetable which is one of the great first food for babies because of its soft & creamy texture, delicious taste and less allergenic nature. 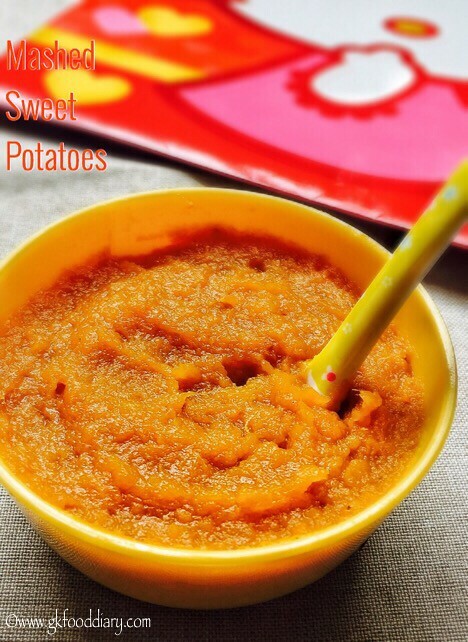 You can introduce sweet potatoes to babies from 6 months and this sweet potato puree/mash is good to begin with. 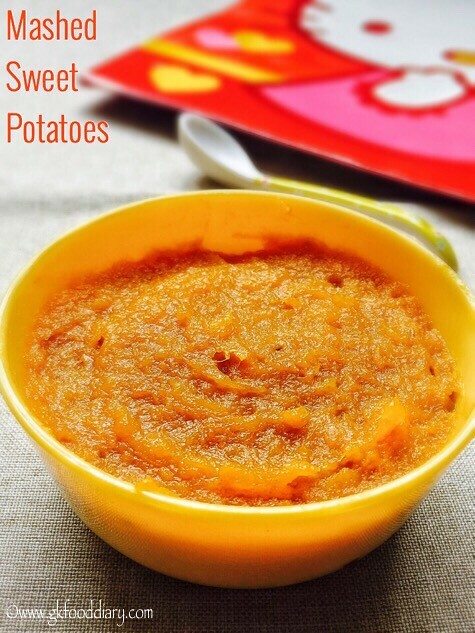 This mashed sweet potatoes is not only meant for babies, even kids and adults will relish as it’s tastes so good. Check more sweet potato recipes for babies, toddlers and kids here. In this post, read more on the health benefits of sweet potato for babies and information on how to cook sweet potatoes for baby food. Baking – Pre heat oven for 425 degrees F. Prick sweet potatoes with small knife and place in a baking tray. Bake it for 45 minutes or until tender and the skin is wrinkled. Peel the skin once its cooled down. 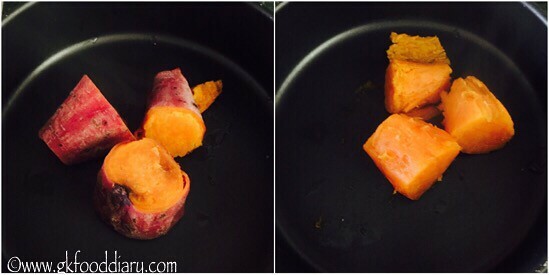 Boiling – Cut sweet potatoes into small pieces and boil it in a saucepan with water till its immersed level until soft. Peel the skin once its cooled down. Pressure cooking – Cut the sweet potatoes into 1 inch pieces and pressure cook it in a cooker with water till its immersed level until soft. Peel the skin once its cooled down. More details on pressure cooking sweet potatoes given in the steps below. 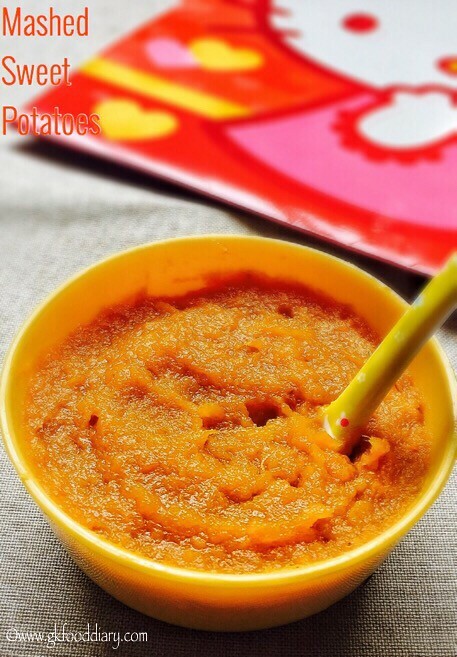 Now Let’s check how to make this sweet potato puree recipe for babies and toddlers. Keep all the ingredients ready. Wash the sweet potatoes thoroughly in running water. Then cut them into 2-3 pieces depends on its size. Then pressure cook sweet potatoes with enough water for 2-3 whistles. Open the cooker once pressure released . Alternatively you can steam cook/bake the sweet potatoes too. Carefully take the cooked sweet potato pieces from the pressure cooker and place it to a wide bowl. Then Peel the skin with your hand when its warm to touch. Then Mash the cooked sweet potatoes well (without any chunks) with a fork and set aside. Alternatively you can puree the sweet potatoes in a mixie/blender to get fine puree. Add little water while grinding if necessary. Heat ghee in a pan and add mashed sweet potatoes along with cardamom powder (if using) to the same pan and fry them for two minutes in low medium flame. Switch off the flame once the sweet potato mash is mixed well with ghee. Cool it down and serve warm. Adjust the consistency by adding water/breastmilk/formula while feeding your baby. 1. Keep all the ingredients ready. 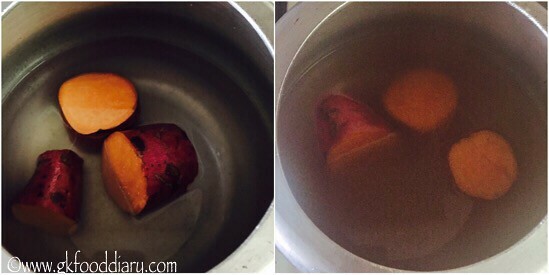 Wash the sweet potatoes thoroughly in running water. Then cut them into 2-3 pieces depends on its size. 2. Then pressure cook sweet potatoes with enough water for 2-3 whistles. Open the cooker once pressure released . Alternatively you can steam cook/bake the sweet potatoes too. 3. Carefully take the cooked sweet potato pieces from the pressure cooker and place it to a wide bowl. Then Peel the skin with your hand when its warm to touch. 4. 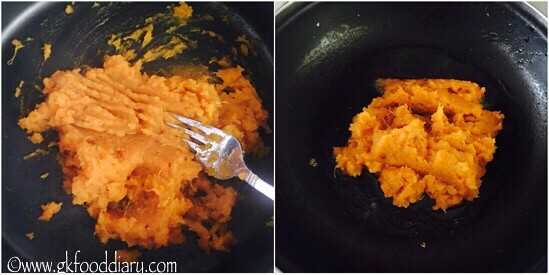 Then Mash the cooked sweet potatoes well (without any chunks) with a fork and set aside. Alternatively you can puree the sweet potatoes in a mixie/blender to get fine puree. Add little water while grinding if necessary. Heat ghee in a pan and add mashed sweet potatoes along with cardamom powder (if using) to the same pan and fry them for two minutes in low medium flame. 5. Switch off the flame once the sweet potato mash is mixed well with ghee. Cool it down and serve warm. Adjust the consistency by adding water/breastmilk/formula while feeding your baby. 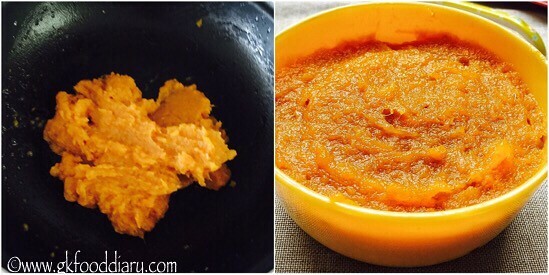 Healthy sweet potato puree/ mash is ready! 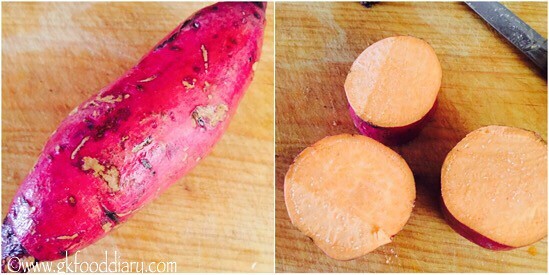 Select sweet potatoes with less brown spots for baby food. Adding cardamom powder and ghee helps in easy digestion, enhances flavor and taste ,but it is purely optional. Skip it if you don’t prefer. 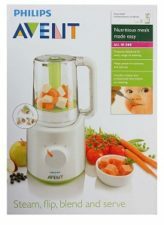 For small babies, you can puree the sweet potatoes with little water after peeling the skin using a blender. You can adjust the consistency by adding water/breastmilk/formula while feeding.